MSC Industrial is one of the largest distributors of metalworking, repair and operations (MRO) products and services for manufacturers worldwide. They take pride in having over 1 million product offerings, many of which are itemized in their annual Big Book, a master catalog that is over 4,000 pages. One of MSC’s primary goals is strong customer service, hoping to ensure supply purchases are fast and easy. That poses a challenge for the online version of the Big Book, a challenge that Dirxion helps MSC overcome every year. In order to create a fast online catalog experience, Dirxion uses custom processes to provide an optimal experience. 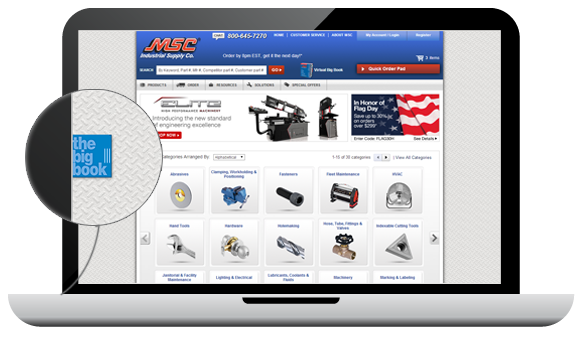 Because of the scope of this project — a few thousand pages, hundreds of thousands of product links — our production engineers fine tune page outputs and set up a unique linking algorithm to connect the Big Book to MSC’s e-commerce pages. Every time someone visits the MSC site, the online catalog is available through a tab on the left-hand side that opens an embedded version of the Big Book. Once opened, pages click through effortlessly with minimal loading time through unique compression settings. Thousands of pages, hundreds of thousands of links, all loading for MSC’s customers near-instantaneously. From here, you can search for specific items, add to cart and check out. If you need to come back to a page, simply bookmark the page. There’s a variety of features available in the MSC online catalog, and no features were compromised in creating this custom display.